Dabur Clove Toothpaste is a herbal toothpaste that uses the antiseptic and anti-bacterial properties of cloves to help keep teeth strong and gums healthy. Traditionally, cloves are said to reduce pain in the teeth and help in case of minor infections. Dabur uses the antibacterial and analgesic properties of cloves in the making of its toothpastes. - Dabur Clove Toothpaste helps fight germs - It relieves toothaches - Prevents cavities and decay It contains ingredients like clove oil, jamun bark, calcium carbonate, acacia, lotur bark etc. 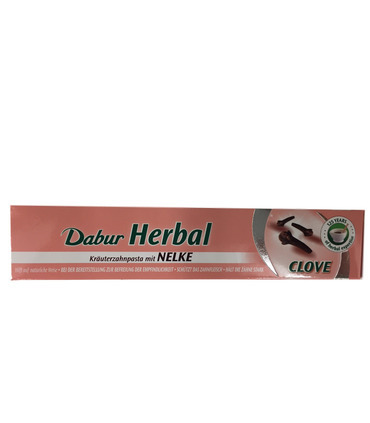 Dabur Clove Toothpaste is a herbal toothpaste that uses the antiseptic and anti-bacterial properties of cloves to help keep teeth strong and gums healthy. Traditionally, cloves are said to reduce pain in the teeth and help in case of minor infections. Dabur uses the antibacterial and analgesic properties of cloves in the making of its toothpastes. It contains ingredients like clove oil, jamun bark, calcium carbonate, acacia, lotur bark etc.